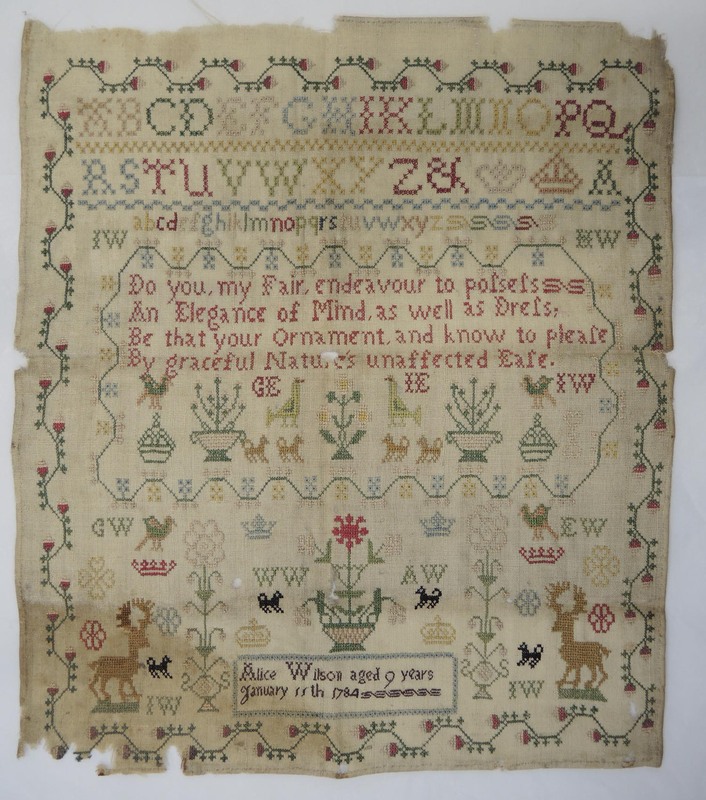 There are currently 70 samplers on display in the exhibition Embroidered Stories: Scottish Samplers, so we thought this might be a good time to share some simple steps for caring for your objects. This isn’t intended to be a comprehensive guide, but just to offer some basic advice. There is a lot of other information available on the internet about caring for textiles, and some links are given at the end of the this post. 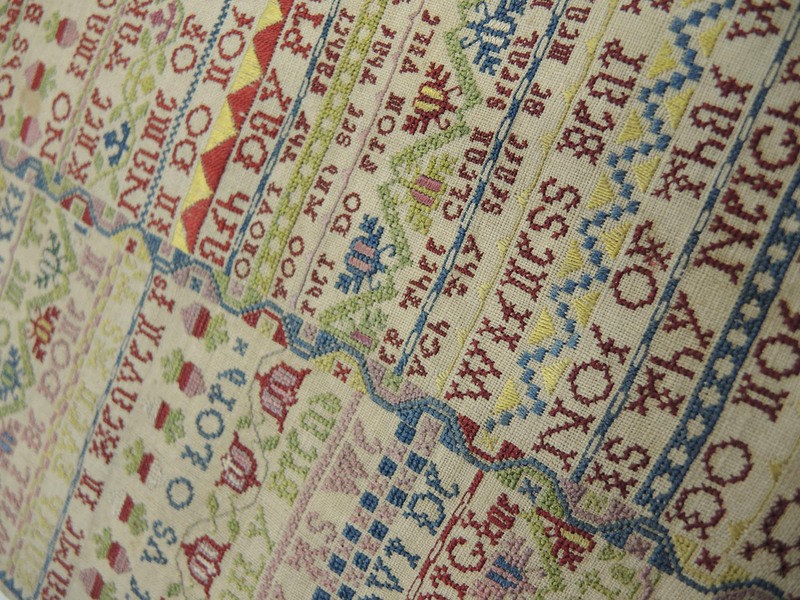 Close-up of the stitching in a sampler from the National Museums Scotland collection. As a basic rule, remember that prevention is better than cure, so think about ways to protect your sampler against damage happening in the first place. Some of the things that cause the most damage to textiles are light, dust, pests, contact with inappropriate materials, poor handling and inappropriate storage. Light causes a great deal of damage to textiles, fading dyes and causing eventual breakdown of the fibres. Simple steps to prevent this would include avoiding displaying your sampler opposite a window, in direct sunlight, or under a spotlight. Some of the colours on this sampler are faded on the front (left) from exposure to light. The colours on the reverse have not been exposed and are un-faded (right). Storing and displaying your sampler in as stable an environment as possible will aid its preservation. Avoid extremes of hot or cold, and large fluctuations of temperature. A cool environment is generally best, as heat and humidity can encourage mould growth and accelerate corrosion of any metal elements. Mould can appear in different ways: it can be active where it appears soft and spongy, or inactive where it looks dry and powdery and can generally be gently vacuumed off. In both cases, it is worth seeking advice as there are Health and Safety implications with active mould, and if left untreated it can spread through a collection. Try to avoid hanging the sampler above a radiator, as it could suffer from the fluctuations in temperature as well as potential dirt accumulation. It is also best to avoid hanging textiles on the external walls of a room. There are a number of insect pests which affect textile collections, with the most common being the clothes moth. Regular inspection and good housekeeping (moths like dark and dirty corners) will help minimise this risk. If a sampler shows signs of active moth infestation do ‘quarantine’ it by sealing it in a clear plastic bag, to protect other objects in your collection. If the item is made of textile only (e.g. no metal elements), then once it is completely sealed you can place it in a domestic freezer for two weeks to kill insect pests. Take care when removing the package from the freezer, as it will be vulnerable to damage until defrosted. If in doubt, consult a Preventive Conservator. It is always tempting to touch textiles, to feel the weight and quality of the weave and embroidery, but contact with our hands can be a source of damage as the salts and oils in the skin transfer to the object and can eventually cause a yellow appearance. The simplest step to preventing this is to ensure your hands are always clean and to remove jewellery that could catch on the sampler and cause damage. Good storage (e.g. in an acid-free box), and display (e.g.in a sealed frame) will prevent dust from settling on the sampler. Dust can be very disfiguring and can cause long term damage. Dust is not only acidic but can cut fibres if it works its way into the weave. If the sampler is dusty it can be gently cleaned with a soft brush, working the dust into a vacuum cleaner nozzle on a low power setting. For other issues such as soiling and staining, which require cleaning, and complex problems such as removing adhesives or sellotapes, support for areas of damage, it is best to employ a textile conservator, who is professionally trained to treat your sampler in a safe and effective way. 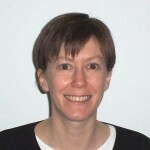 The best way to find a textile conservator working in private practice in the UK is to consult the Conservation Register at www.conservationregister.com. This sampler demonstrates complex condition issues, such as general soiling, staining and areas of loss which are best treated by a textile conservator. Try to use good quality, conservation grade materials when storing or displaying your sampler. If using cotton fabrics for storage, boil wash it first to remove impurities. If using paper materials, select unbuffered acid-free tissue and boxes where possible, or use barrier layers like tin foil or Melinex polyester film to line boxes that are not acid-free. Example of old mount materials that can cause damage to samplers. The best way to store your sampler is flat. This can either be in the frame, or in a storage box or folder made from acid-free card. Ensure nothing is placed on top of the sampler when stored. 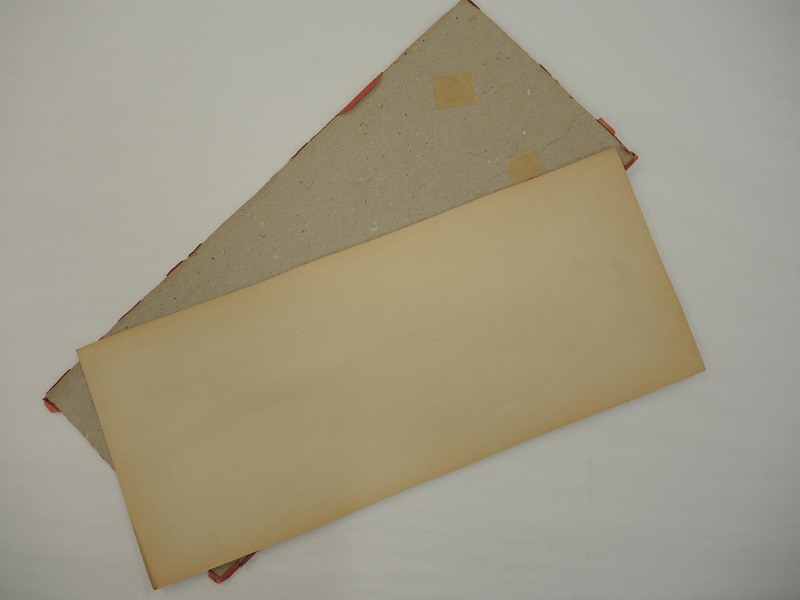 Example of storage folder made of conservation grade materials. 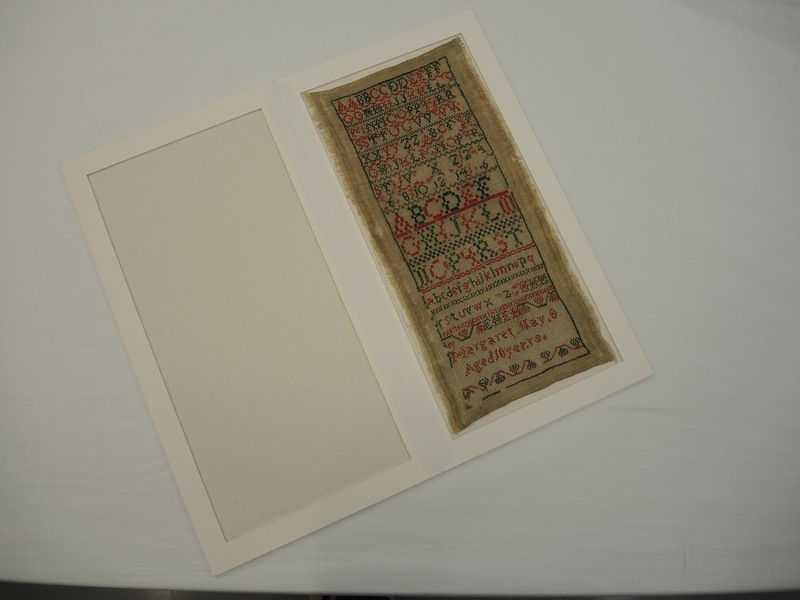 Samplers are usually displayed framed, which protects them from many of the likely causes of damage already described. It also provides a degree of protection by excluding dust and pests. Do consider the materials being used, e.g. using a glass or Perspex with a UV filter to reduce the impact of fading. Mounts and sub-frames should be of an acid-free card, and a barrier layer of foil or Melinex should be used between the sampler board and frame backboard, which is often made of wood. Try to work with a good framer who is experienced in working with textiles. It is standard practice in museums to mount samplers onto padded boards, which acts as a support in storage and facilitates framing. These are made with conservation grade materials, e.g. acid-free card, washed cotton domette and scoured cotton. The materials are secured to the back of the board under tension, and the sampler then carefully stitched to the front. The padded board can then be put into the frame, taking care to have a spacer or window mount between the sampler and the glass so that there is no contact. There are a number of sites on the internet which offer other useful information and advice. Taking some of the steps should help to preserve your sampler and ensure it is enjoyed by generations to come. Embroidered Stories: Scottish Samplers is on at the National Museum of Scotland until 21 April 2019.